Color: Clear It is used to increase the polishing effect on onyxes, marble, natural stones, granite, agglomerates, terrazzo. Also it is used to brighten up the lost polishing effect. The application may increase the polish from 5-6 to 15-16 point of gloss. This product is completely without solvents which contains chlorine, that may cause dangerous irreversible effects to human beings. 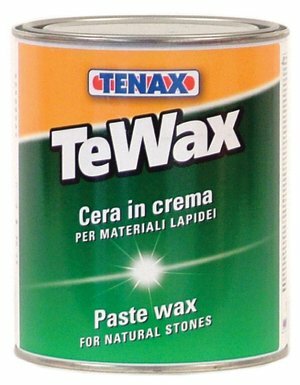 Tewax is a result of special waxes melted through solvents that allow a high penetration level on treated material leading to a long-lasting effect. Tenax Travertine Filler -- Buff 125 ml.